Kemps is the oldest habitable dwelling in the Old Village, built in 1540 by Edward Blaker for his family. The local records show the house being occupied by descendents of Edward Blaker until 1869. Between 1869 and 1906, the records of who lived here are yet to be uncovered. The house was occupied in 1906 by J.W.Hylands a “dealer in horses”. 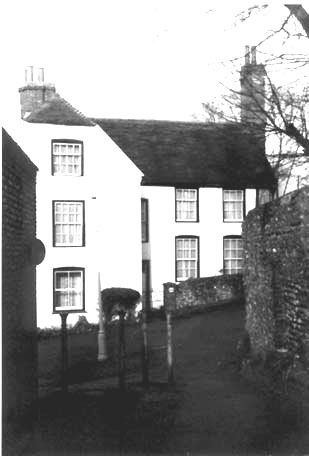 During the nineteenth century at least three houses in the area were occupied by the Blakers. The house is of flint construction with brick quoins. The walls to the front of the property have been stuccoed. The walls to the west side and the rear are flint knapped. The large chimney in the West wing has a spiral staircase wrapped around it. The original leadlight windows with glazing bars have been replaced during the nineteenth century with typical sash windows. Some of the descendants of the Blaker family have become famous and successful by today’s standards, with Harry being the first surgeon appointed to the County hospital. There are local tales about the house. There is little evidence to support the tales so far, but they are worth retelling. The attic room was used by the first protestants in the area, probably Quakers as a Meeting Room during the reign of Henry VIII. The land which the house is built on was sold to Edward Blaker. There are rumoured to be many passageways and underground tunnels from Kemps to the other buildings in the area, such as the Old Manor and Hangleton Manor. Evidence has been found of a passageway under the road to support this, but from the internal structure as it is today, it is unclear where these passageways could have been. We know that chalk can be easily tunnelled, as it is soft when dug and then hardens, which does add more credibility to this tale. “The attic room was used by the first Protestants in the area, probably Quakers, as a Meeting Room during the reign of Henry VIII.” This is unlikely. Henry VIII died in 1547 and the Quaker movement did not start until 1652. For anyone puzzled by my reference 1652 on this page as the start of the Quaker movement, and 1647 on another, the earlier date marks the start of the movement which became a formal organisation 5 years later. Still well after Henry VIII.